Mayan clothing history has been pieced together from oral histories and archaeological excavations, or scientific digs to uncover past cultures. The Aztecs, who rose to power in about 1200 C.E. in the Valley of Mexico, which surrounds modern-day Mexico City, abruptly changed their culture in 1521 when Spaniards began to force Aztecs to adopt a Spanish way of life. 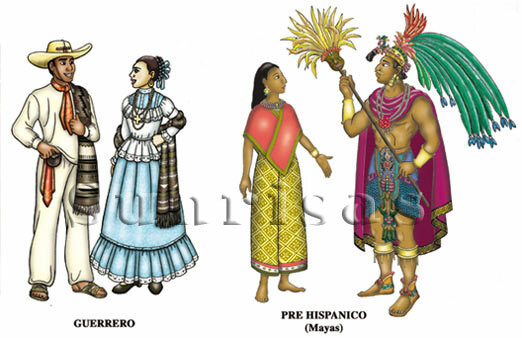 The Maya wear both modern Western-style clothing and traditional garb (although the latter is more commonly worn by women). Kings wore a large square of cotton cloth wrapped around the shoulders. They also wore capes made of embroidered cotton or jaguar pelts. At times sisal, from the agave plant, or silk was used. The Mayans are known by their typical traditional clothing, which are mainly woven by the women. The most beautiful designs of weaves are found in Chiapas, Mexico. Women that belonged to this group have always worn the huipil. This is a kind of a decorative blouse, which is made of lightweight cotton. The neck is elaborately embroidered with designs representing the cosmos, the gods and their helpers. When a Mayan woman puts on her huipil, she becomes the axis of this symbolically represented universe. The cut-step hairstyle was popular among noblewomen during the Classic period and the type of tattoo on her cheeks was most likely an embossment or raised surface where grains of sand were inserted into the skin to create bumps. Traditional Mayan clothing cannot be complete without the mention of jewelry worn by the Maya people. This was as per the position of the person in the tribe. Beads and other decorative items were used for the neck, nose, ears, mouth and even the legs. Mayan men's basic costume consists of pants, shirt, and sash. The shirts and pants are European in style and are machine stitched. Shirts are often personalized by the addition of decorative, hand-woven collars. Pants are usually of knee or calf length, with wide, straight legs, and an unfitted waist. They are often embroidered with animal or human motifs or with geometric designs. Wider belts called mecapal are used to carry heavy loads. This cloth or leather strip has ends which are joined together by cord. The cord is used to secure the bundle and the strip is place on the forehead. Fashionable men had a waistband made of a wide cloth, rolled to appear like a thick belt about 6 inches deep. Some men wore capes, and they varied from a simple all-round shoulder cape to jaguar skins and sheets of feather-work hanging down the back. 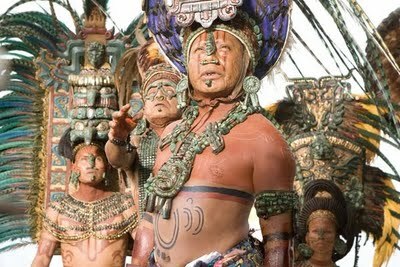 It is hard to overstate the importance of dress among the Mayans. In Guatemala in particular, with its history of strife and division, it is not just a statement of who they are but, a but a clear, occasionally even defiant, declaration of who they are not.